This is an important and very commonly asked question, although it doesn’t have as simple of an answer as you might think. A simple Google search and you will find all sorts of answers ranging from 20 days up to 45 days. The problem is many of these statistics are including different types of industries and professionals. For this reason you won’t get a real clear picture for what you’re looking for. The average time to hire a person varies greatly depending on many factors. This includes the type of job, the industry, the candidate, special skills needed and other variables. All of these things that can significantly increase or decrease the time it takes to hire the right person. The hiring process is made up of several pieces including sourcing, the actual interview itself, final stages, due diligence and references. Depending on how your company has things scheduled or how your team has things structured, this also very greatly affects the interview process. The question I hear quite often is not just how long is the hiring process, but really how fast can I hire someone. We all want to be able to hire good talent as fast as humanly possible. I recommend that hiring the right talent be your key focus rather than speed. You don’t want your interview process to be too long or too short. Too short and you may risk hiring the wrong person because you didn’t do your due diligence. Too long and you risk losing good candidates in the process. In 2017 the average length of hiring processes in the US, according to glassdoor was 23.8 days, which was slightly higher than 2014. Again this can differ from company to company and throughout industry. As recruiters here at Aldebaran Recruiting our average is between 30 to 45 days. This is above the glassdoor average but there also is a different level of care that goes into the work that we do. Working with a recruiter will likely take a little bit longer if the recruiter is doing their due diligence to find the right person. The work the recruiter is doing in someway supplements and adds on to the work that you were already doing. If we look at the time it takes to hire within different industries in the US things vary greatly. The very fastest we have seen is in construction which takes an average of 12.7 days to hire. On the other end of the spectrum, health services roles take an average of 49 days to hire. That is a large delta, basically 13 to 50 days. If we look at professional business services roles, such as a lot of the white-collar jobs of the US, those are right in the middle around 26 days. As a good rule of thumb I would say 30 days is a good average for the amount of time it should take for you to fill a position. You can count a little bit longer if your role requires some sort of specific skills and talents. It’s important that you actually examine the time it takes in different aspects of your hiring process. You want to look at how time is being spent bringing candidates in for first, second, third, etc. round interviews. This is a place where you can often find time to cut in your hiring process and speed things up. As written in other blogs, I’m a big proponent of having your hiring and interview process be streamlined and efficient. This is often the place where clients and companies make the biggest mistake. 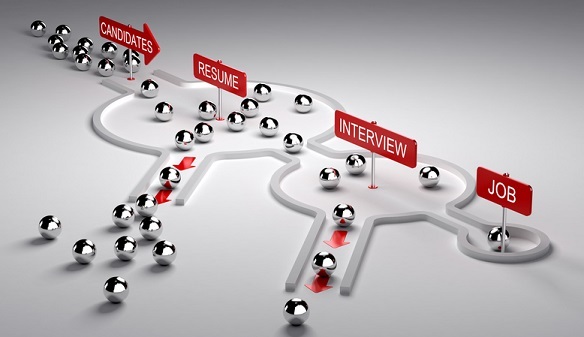 They make candidates stay with your interview process and it becomes cumbersome. You may have that part dialed in and the front of the funnel may be suffering. Here is the actual sourcing and recruiting side of the process or we also call that acquisition. This is the part where you’re actually attracting qualified candidates for your position. This is the place where most of our clients have troubles and why they hire a headhunter like us. They get complaints that they’re not having qualified submissions come through on their website. They complain that their job is posted on all of the job boards but that the people that are applying for the job boards are low-quality. This is becoming extremely common in the market. It’s becoming less and less likely that the right talent for your company would find you on their own. You’ve got to find ways to be proactive to get your company and your name out to the right people. And then you want to be able to move them through a streamlined interview process. This is the number one place where you’re going to speed up your hiring process. The more niche or specialized, and the more competitive your industry, your company or your market, the longer your hiring process will likely be. This is going to make the biggest difference in terms of you being able to hire people quickly. What’s more important is ensuring you have a streamlined and efficient process to find you the best talent that you can hire in the fastest way possible. Shooting for a 30 to 45 day window is a good goal, but don’t beat yourself up if you end up going a little bit longer. Especially if you have some type of specialized talent that you’re looking for. Or conversely if you have something extremely simple, you should be holding yourself to have it be faster. The key here is to pay attention to your interview and sourcing process. These are the places where you have the most control over being able to streamline your process into something that is really workable. At the end of the day, if your interview process is taking too long or it’s taking too long for you to hire talent this most likely where the issue is. The front of the funnel is the trickiest part when it comes to recruiting. Being able to find the right talent and getting them right at the start moving through your interview process. Here at Aldebaran we talk to between 100 to 200 people in order to show our clients one single good resume for a position. 100 to 200 is a lot of people to be reaching out to and communicating with in order to produce one solid resume. And we are extremely streamlined and laser focused on what we do. Anybody using less extremely focused tactics will likely have to talk to three or 400 people before producing a good resume. This upfront work needs to be streamlined and it needs to have the time in reality to be able to produce a result. Without that sheer volume being put in the front of the sourcing funnel it’s going to be a slower experience. If we were only working incoming submissions there are many jobs that may simply never get filled. Having a proactive outbound recruiting strategy is the number one thing to speed up your process and attract the right people. The points in this blog are going to give you a big advantage. You must put the work in to create a good front of the funnel strategy and put the work in to streamline your interview process. If you do these things so you can turn your company into a rockstar team and really take things to the next level. Have questions or want to hire us to speed up your process? Let’s chat!